For many years this family granola recipe was a staple in the Katz home. Our children grew up on it and we were right behind them with bowls in hand. Over the years we changed out vegetable oil with our own organic olive oil and a good amount of the sugar with our honey. We added additional warming spices of cinnamon and nutmeg for their health benefits and switched to organic rolled oats, added some organic flax seed and whole toasted almonds. Our family feels it is time to share our healthy honey and almond granola with you and your family. Made and baked in our Napa River kitchen...serve with milk or yogurt drizzled with a little extra honey or just scooped up by the handful as a snack! 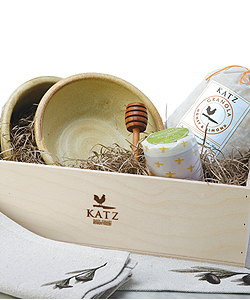 Stock your pantry with a few bags of KATZ Honey and Almond Granola, and enjoy your healthy breakfast even more with these earthy ceramic bowls.